I’ve had the honor of working for Dr. Cavazos for a little over 16 years now. I first met Dr. Cavazos at Riverside hospital when I worked in one day surgery. I was so impressed by how well he treated his patients and the hospital staff that I decided I wanted to work for him one day and told him every time I saw him. He would always tell me, “That will never happen. My nurse is never going to leave.” These conversations continued for many months until one day he came in and said “you’ll never guess what happened? My nurse gave her notice. Her husband is military and they are being transferred.” So the application and interview process began. After overcoming some barriers, I began working for him on October 16, 2002. Dr. Cavazos has been in practice on the Peninsula for over 20 years now. He is experienced in total joint replacements, sports medicine, and bone densitometry. Probably his favorite operation to perform would be a total joint replacement – whether it is a knee, hip, or shoulder. He also enjoys doing outpatient surgeries and takes great interest in a patient’s bone health. Most office visits conclude with the question “Do you know what your T-score is?” He then proceeds to educate the patient on why it is so important to know. A team approach in any work environment is key to a successfully run business. Our team consists of two physician assistants, a registered nurse, a medical assistant, and a surgery scheduler. Along with the physician, we all work together to make sure the patients experience is top-notch. I work with a great group of girls which include Sarah, Rachel, Jacquelyn, and Glenda. I truly consider them to be a part of my extended family. We all work well together and our goal is to make sure Dr. Cavazos and our patients’ are happy and well taken care of. He is truly loyal to us and that’s why we love being referred to as Team Cavazos. “You can’t get today back – so you have to make a difference in someone’s life.” I will never forget this comment made by Dr. Cavazos. It truly represents the way he practices medicine and in particular orthopedics. 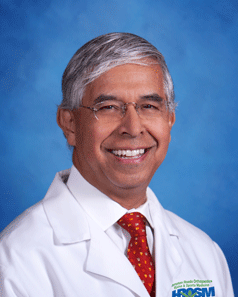 Dr. Cavazos strives to provide quality orthopedic care for all of his patients. He truly does make a difference in my life and in the lives of his patients.